Lara must use her brawn and her brains to overcome an impossible situation. The player must guide Lara through physics puzzles, challenging environments, and a high-octane story to overcome a harrowing situation and make it off of the island alive. 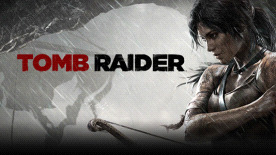 Tomb Raider is pushing the action genre forward with visceral third-person combat and a deep weapon and gear upgrade system that Lara will have to strategically employ to overcome increasingly difficult enemies and environments. If you like the Uncharted or Batman Arkham franchises, Tomb Raider’s offering will compare favorably to these high quality experiences, but with a unique Survival Action twist. It wouldn’t be Tomb Raider without certain signature elements. In addition to platforming, Lara will have to explore large areas to earn experience points that will upgrade her weapons and gear. One of the key elements of dynamic traversal is the gear gating gameplay loop: over the course of the game, Lara will continually improve her gear and will be able to reach previously inaccessible locations that will allow her to upgrade her gear and weapons even further.